We created the Louisa Nelson Awards as an annual accolade honoring women of achievement, inspiration, and vision in Nashville who show exemplary successes in their field and leadership in the community. "Many know the story of our great-great-great grandfather, Charles Nelson -- the pioneering founder of Nelson’s Green Brier Distillery and the leading producer of Tennessee Whiskey in America in the late 1800s," says Charlie Nelson, "but few know about Louisa, his devoted and hard working wife who assumed control of the family business after his death in 1891, until Prohibition forced her to shutter it in 1909. At the time, she was one of the only women ever to have run a commercial distillery. In addition being a powerful business owner, Louisa Nelson displayed enlightened leadership that benefited the entire community. 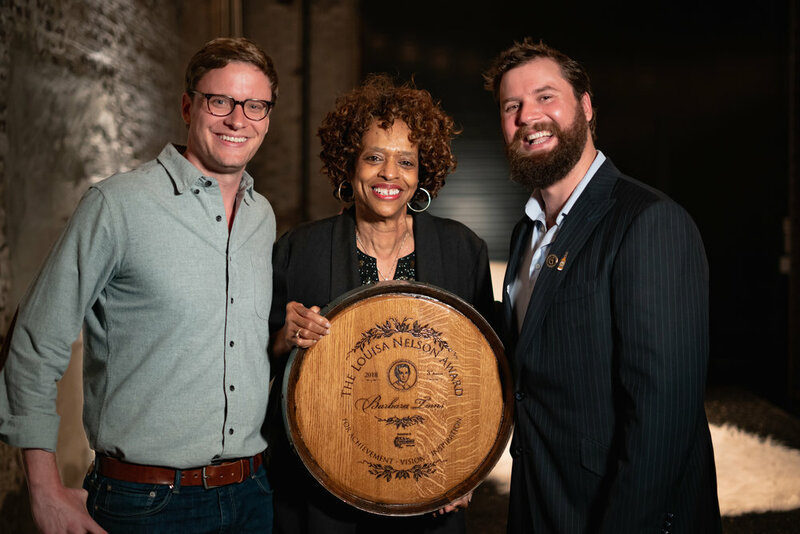 Today, her foundation and business model remains a driving force in our own practices, and we named the big copper still that anchors our production floor 'Miss Louisa,' in her honor." To commemorate Louisa's role in the brand's history, the Louisa Nelson Awards are given to three Nashville-area business women who embody the characteristics of their ancestor: hard working women excelling in their industries and making a positive impact in their community. To celebrate each award recipient, Nelson's Green Brier Distillery will make a significant donation to a local charity of her choosing. BARBARA TOMS: Barbara's devotion to using Sweet Creations Pie Bakery to participate in the revitalization of historic Jefferson Street, her commitment to providing jobs for the community, and her recognition as a key minority- and woman-owned business leader are just part of who she is. She has assumed leadership roles in her community, as well as in her business, family, and church. In addition to being a lifelong learner, with a Master's degree in Divinity and a Juris Doctor degree, Barbara also helps to educate others through her participation in nonprofit undertakings to help with financial literacy, housing, and more. Sweet Creations is the only retail pie bakery in Nashville specializing in sweet pies and offers several varieties including fudge, pecan, bourbon pecan, chocolate chip pecan, sweet potato, apple, peach, jus’-like-chess, and cherry. Located on Historic Jefferson Street, Sweet Creations’ pecan pie was named one of America’s Best Pies by Travel+Leisure magazine in 2013. INGRID McINTYRE: Reverend Ingrid McIntyre is the co-founder and Executive Director of Open Table Nashville. Open Table Nashville is an interfaith homeless outreach nonprofit founded in 2010 that disrupts cycles of poverty, journeys with the marginalized, and provides education about issues of homelessness. Thanks to Ingrid's visionary leadership, Open Table has led efforts to create twenty micro homes that will provide housing for homeless individuals in south Nashville. This innovative project, called The Village at Glencliff, received some pushback from community residents who did not want to see this housing in their neighborhood. Ingrid has remained a tireless advocate for the most vulnerable residents of Nashville, inspiring many with her courageous vision, compassionate heart, and innovative spirit as a leader in the city of Nashville. KELLY TIPLER: Kelly has built her career and her personal life on helping others. Professionally, in 2001 she founded the Tennessee Respite Coalition, a statewide agency that provides respite for individuals who care for family members with disabilities. In 2011 she founded Turnip Green Creative Reuse (TGCR) - a nonprofit that diverts items from landfills and makes them available to teachers, artists, and the public for creative endeavors. TGCR also delivers educational programs in schools to promote recycling and reuse. TGCR delivers programs to thousands of adults and children every year and has diverted nearly 200 tons of waste from landfills. In her "day job" Kelly works for Metro Government as Metro Beautification Director. She is also co-founder of Pet Community Center, a nonprofit veterinary clinic that has reduced pet homelessness in Nashville by 50% through spay/neuter and preventive veterinary care. Kelly is also a dedicated patron and friend of visual, musical and theater arts. Great-great granddaughter of Louisa Nelson, longtime journalist Carrington (Nelson) Fox recently re-tooled her career by enrolling at the Tennessee College of Applied Technology in Nashville to study building construction. Named the Outstanding Technical Student for Tennessee in 2018, she now works for The Wills Co. design/build firm and blogs about her experiences as a middle-aged mom in construction. 2016 Award recipient Vali Forrister, powerful women's rights advocate; Co-founder/Artistic Director of Actors Bridge Ensemble and Founder of Act Like a GRRRL. Nelson's Green Brier Distillery Co-Proprietor Andy Nelson, a direct descendant of Louisa Nelson, and the head distiller of the family business he has revived with his younger brother, Charlie. Nelson's Green Brier Distillery Co-Proprietor Charlie Nelson, also a great-great-great-grandson of Louisa Nelson, and namesake of Charles Nelson, who travels the country sharing the history and spirits of the company he has proudly reestablished with his brother Andy. Shan Foster, Sr. Director of External Affairs & AMEND at YWCA Nashville & Middle Tennessee. AMEND is an initiative that engages men and boys to end violence against women and girls. He now recruits, educates and equips men and boys to serve as advocates for violence prevention and cultural change. Described as an enthusiastic leader, gifted public speaker, and skilled facilitator, Foster is committed to elevating the conversation about violence against women, engaging men to be leaders and role models, and educating young men and boys about healthy masculinity and respect.